The princess had never had a friend – or better she couldn’t remember having ever had one. She was still young and – at least the magic mirror said – pretty enough, but it had been long since she had last seen the outside world. Closed in the highest tower of the biggest castle of the region, where the evil Barabbablù had confined her, the only living contact she had was with her little, bat friend. It had started flying inside the tower one night when, due to the summer heat, she had left the huge windows open. He had just landed on her bed, close to her. She hadn’t felt scared: it was so little, so cute with its yellow eyes and its pointy nose and fingers. She had soon taken a like to it, so much that, even if it was just an animal and he couldn’t speak, she would tell him all about her fantasies, confide him all of her desires, her wishes for a future far from the castle and from the bad man that had recluded her inside that tower. Day after day, the bat had become her only friend. And as little as he was, the way he cuddled into her hands when she hugged him, the way he looked always straight into her eyes, had sparkled a light inside her heart that she had long forgotten. 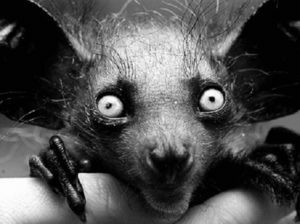 She had fallen in love with the minuscule bat, the only creature able to bring relief to her suffering soul. “I love you,” she said one of those evenings in which the silver light of a full moon illuminated the bat in her hands, and her thin fingers caressing its little head. Then, as silly as it can seem, she simply brought it to her lips and kissed it. And the little bat transformed into a ball of light so strong that the princess had to let go of the bat to cover her eyes. It took some time for the light to fade away. “I love you, too,” a man’s voice said. When she opened her eyes, in front of her there was no small bat anymore, but in its place the strangest man she had ever seen. Tall, with a pointy chin and slick, dark hair. A pretty decent man, overall, she thought, but she soon looked away when her eyes adapted to the light and she realized the man was naked. Yet, she couldn’t take her eyes off of his most curious feature: two huge, black wings on his back. The strange man lifted her up into his arms and, as if it was the most normal thing, he jumped off the tower. And instead of crushing on the underlying moat, the princess flew to the sky, towards a new life.